Fresh cheeses, chocolates and nuts make ideal partners for the luscious fruit flavors of this Gold Medal winning berry wine. Take a walk on the wild side and experience how the foods accentuate its hints of jam and clove. No celebration is complete without popping a bottle of bubbly! Crossing Vineyard's Blanc de Blancs is an elegant sparkling wine produced using the classic French methodology. 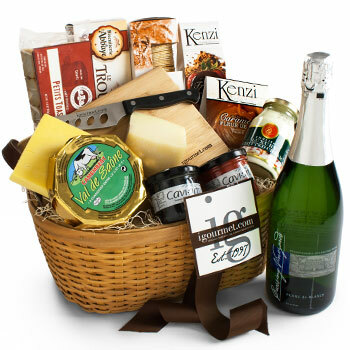 Caviar, goat cheese and chocolate provide elegant pairings, elevating this gift basket's appeal to legendary heights. 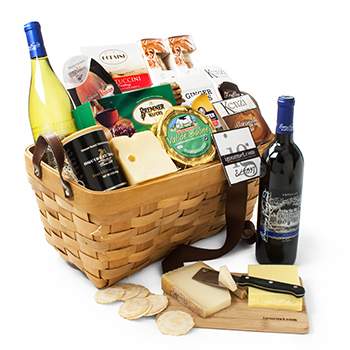 There could be no better gift for a red wine lover than a fine bottle of Cabernet paired with zesty cheeses, cookies, and chocolate. 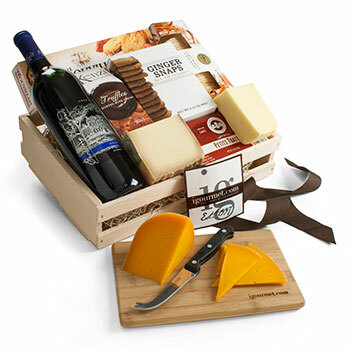 The assortment of semi-soft and aged cheeses in the basket works wonderfully with this award-winning Cabernet Sauvignon's subtle accents of toasty oak and vanilla and lingering flavors of cherry, blackberry and anise. Barrel-aged to perfection, this Merlot produces a long, smooth finish, making it a perfect match for sweet and savory foods. Accompanied by artfully crafted cheeses from Italy, Holland and Spain, this crowd-pleasing collection is ideal for entertaining. This collection features the Silver Medal winner at the 2007 World Wine Championships, conducted by The Beverage Testing Institute. This spectacular wine is paired with imported cheeses from Italy, France and Australia. The toasted vanilla notes and hints of citrus in this Chardonnay are accentuated by the cheeses, creating a delightful taste experience. A bottle of red.. a bottle of white.. it all depends upon your appetite. 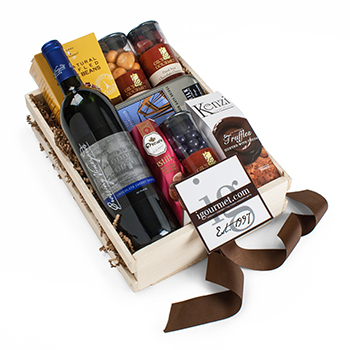 This decadent gift basket features Crossing Vineyard's Merlot along with its award-winning Chardonnay. 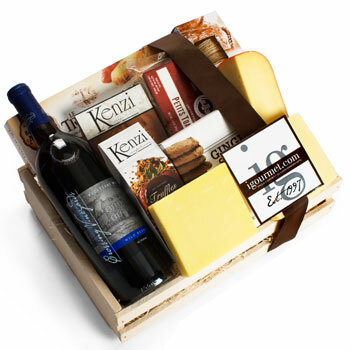 The wines are paired with a host of imported cheeses, nuts, cookies and crackers, ranking it as the ultimate choice for any wine and cheese lover. Gourmet chocolate is a longstanding partner for the sweet notes of Port wine. Crossing Vineyard's take on Port brings together the flavors of chocolate, cherry, plum and oak - all in one bottle. Also included are some of the tastiest gourmet chocolates around. Set the table for dessert and experience how chocolates and Port go hand-in-hand. 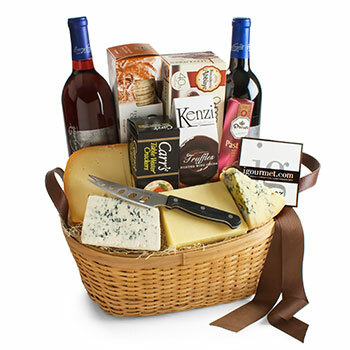 This irresistable gfit basket includes two bottles of Crossing Vineyard's dessert wines: Chocolate Cherry Port and Wild Berry. 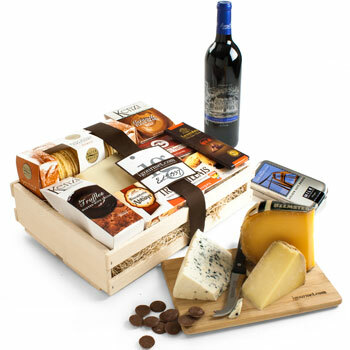 Chocolates and cheeses are two customary partners for dessert wine, so you'll find an abundance of each in the basket as well. 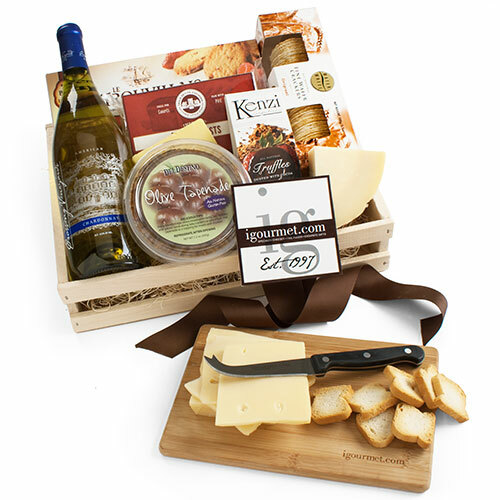 Send this festive gift to an adventurous foodie who craves new gourmet experiences.